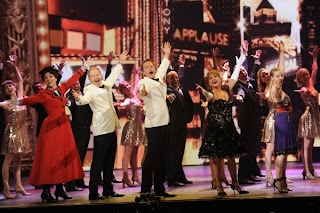 Last Sunday it was Tony Awards night and, as usual, there were plenty of musical numbers to lift up our hearts. From the opening number with the cast of THE BOOK OF MORMON and Neil Patrick Harris to the end of the show, there was music for everyone’s taste. For people, who like me, live too far from Broadway and can’t go there as often as they like, this is pure gold. Here in Portugal we can’t see the Tony’s ceremony on the television, but thanks to youtube and the lovely people who upload the scenes from the telecast, I can enjoy the show and here are the numbers from the musical nominees, plus the opening and closing numbers.I hope you’ll have as much as I had seeing them. For more on the Tonys and a complete list of the winners, click here.